Andra Pradesh Mahatma BC welfare 1st Inter Admission Notification 2019 at aprjdc.apcfss.in. TS Backward Classes Welfare Residential Educational Institutions Society Inter 1st Year Admission Exam on date 09-05-2019 Official Website http://aprjdc.apcfss.in/. MJP AP BCWRJC CET Online application process begins, exams on March 14th. MJP AP BC Welfare RJC CET 2019 - MJP AP BC Welfare RJC Inter Entrance Test, AP BC Gurukul RJC CET 2019. The candidates who want to apply online can do so through the official website, aprjdc.apcfss.in, the online application process has been started from March 14, 2019. 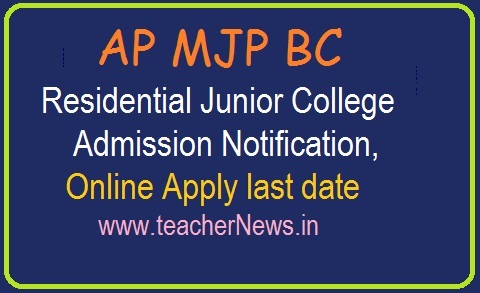 AP MJP BC Residential Junior College Admission Notification, Online application form, How to Apply, Eligibility, Hall tickets, Syllabus, Exam Pattern, Results and More details here. AP Mahatma Jyothiba Phule Backward Classes Welfare Residential Educational Institutions Society (Mjpapbcwreis) Junior Inter Admission test Online Application Form and Hall Tickets Download. The candidates who want to apply online can do so through the official website, aprjdc.apcfss.in. The online application process has been started from March 14, 2019 and last date to apply online is April 14. ఆన్‌లైన్‌లో ద‌ర‌ఖాస్తు ప్ర‌క్రియ ప్రారంభం: 14.03.2019. ఎంపిక విధానం: ఉమ్మ‌డి ప్ర‌వేశ ప‌రీక్ష ఆధారంగా. The candidates can apply through the official website, aprjdc.apcfss.in on or before April 14, 2019. Entrance Exam: May 9, 2019. AP MJP BC Residential Junior College Inter 1st year Admission 2019 | AP Gurukulam Inter MPC, BPC, CEC, MEC Online Apply last April 14th, 2019, Hall tickets aprjdc.apcfss.in.